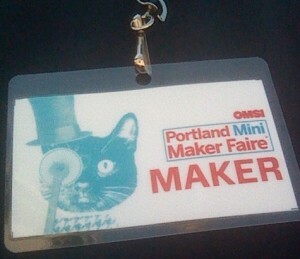 This past Saturday (Sept 15) I got to participate in Portland’s first annual MakerFaire. 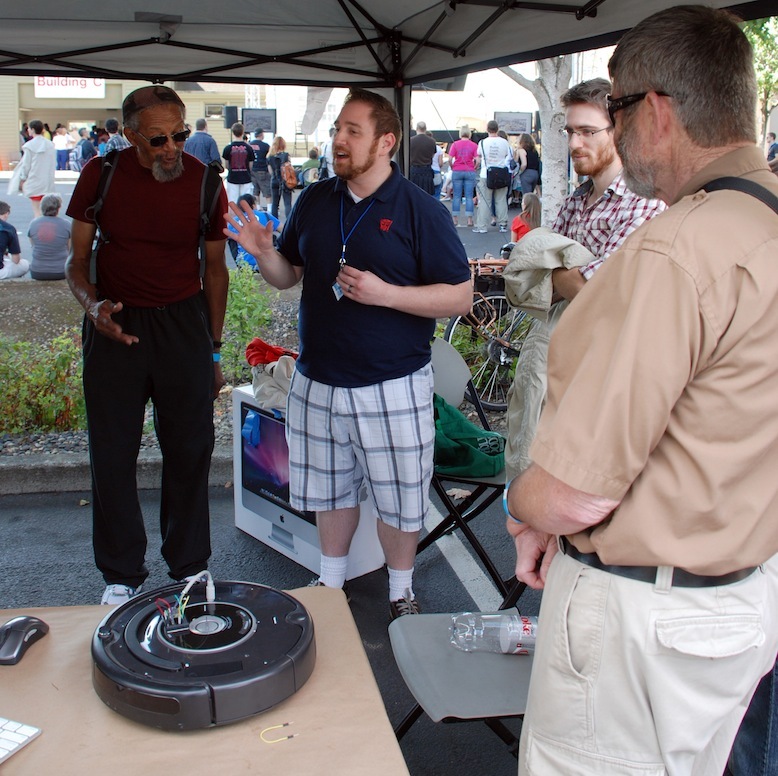 I’ve written about MakerFaires before, but this is the first one where I was showing off a project. Note: I do plan on sharing the details of my Kinect-driven Roomba in a future post. This post is more about my experience at the faire. 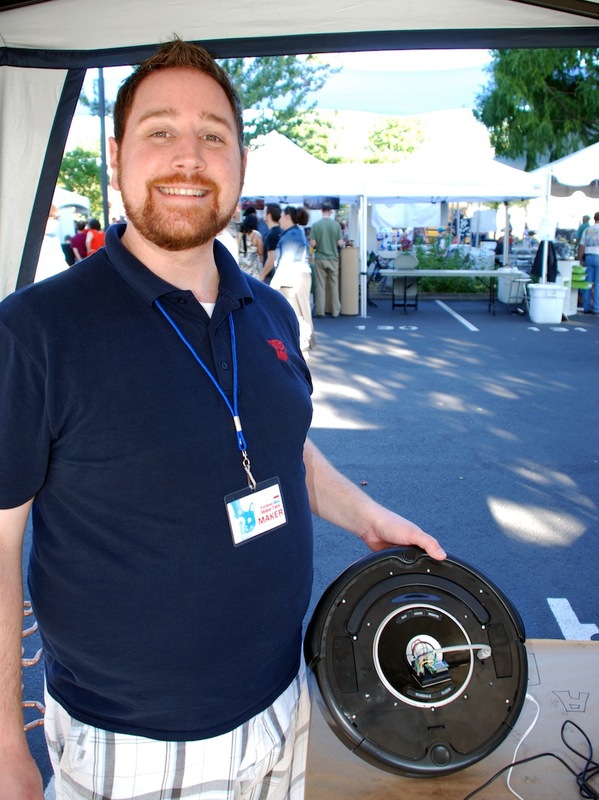 Several months ago, someone had floated the idea of holding a MakerFaire in Portland. I had been contemplating such an event myself, but hadn’t taken the idea to anyone else. I’ve found often that if you have an idea, someone else has the same (or a very similar) idea. It turns out that the folks at OMSI had been thinking the same thing. As they had resources and space, they took it upon themselves to play host to the madness. I asked to be included on the list of people to contact once they got the thing rolling. When it came time, I didn’t really have anything to show off, so I passed up the opportunity to get myself a booth. A hobbyist group I’m a part of, DorkbotPDX, decided to have a booth hosting anything its members wanted to show. At this point I didn’t have anything. I’m the kind of person who likes the spotlight. It’s funny, because most of the time I’d tell you that I’m not very social or outgoing. For some reason though I really enjoy talking, teaching, and performing. I really wanted to have something to demonstrate and so I started thinking about different things I could do. My makerbot was in storage, and they’re pretty much everywhere anyway. 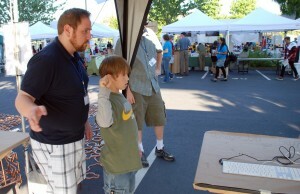 I had been working on a software project – but that wasn’t really in the realm of MakerFaire. So I decided to start on a new project. For our 5th anniversary, Hykel and I got an Xbox 360. I admit that I was as interested in the consol as I was in having the Kinect to play around with. The Kinect became very popular in the maker community following the release of open source device drivers allowing users to write their own software for it. That was a couple of years ago and interest has waned a bit. I still wanted to do something. 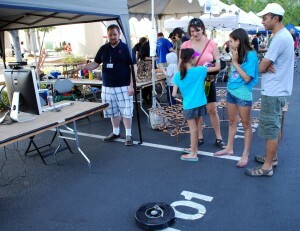 My first idea was to do a telepresence arm. This would have taken arm and hand position and reproduced it on a robotic arm. This idea didn’t last long as I couldn’t find all the servos that I thought I had. So I moved on to a different idea – controlling a Roomba via Kinect. I’ve been in this position many times before. A deadline that was very close, and project that was too big for the time. More often than not, I fail to meet my deadline. This time was different though. Because I wasn’t familiar enough with anything else, I decided to write the driving application in Processing. After several evenings of programming, many in which I stayed up much later than I should have, on Friday night (the night before the faire) I had a working application. 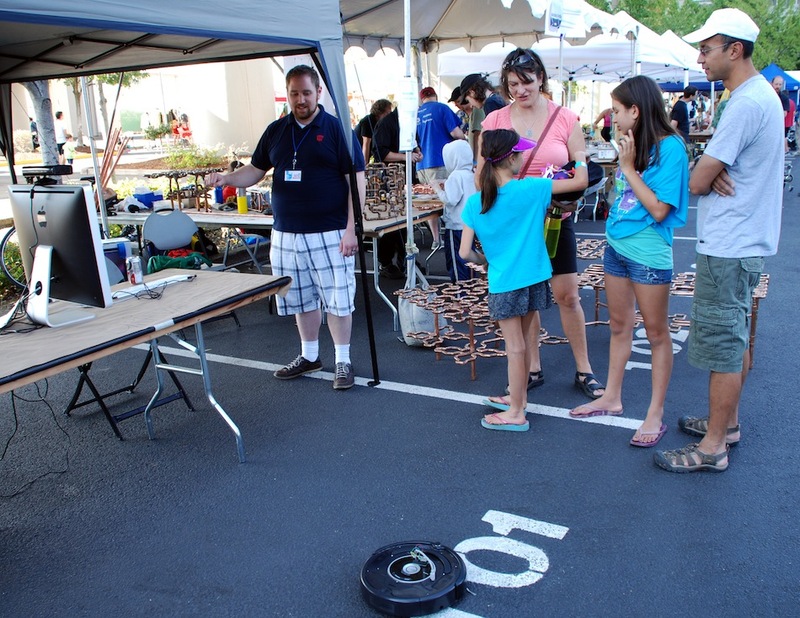 I didn’t sleep terribly well – MakerFaire falls just under Christmas and Halloween in my book. It’s an exciting time, and I’m pretty much still a five-year old in that respect. Hykel was going to do a service project for church that morning, and had invited her friend Jennifer over for breakfast before they went. I made waffles (a tradition which has become known as “Waffle Saturday”). They left around 8:45 and I figured I had a little time to look for some last minute bugs. The faire started at 10. At 9, I re-read the email about setup, and realized that setup didn’t start at 9, but ended at 9:30. Whoops. Time to go! I tried to pack everything I needed and rushed out the door. I even brought a bunch of spare stuff in case someone needed something. 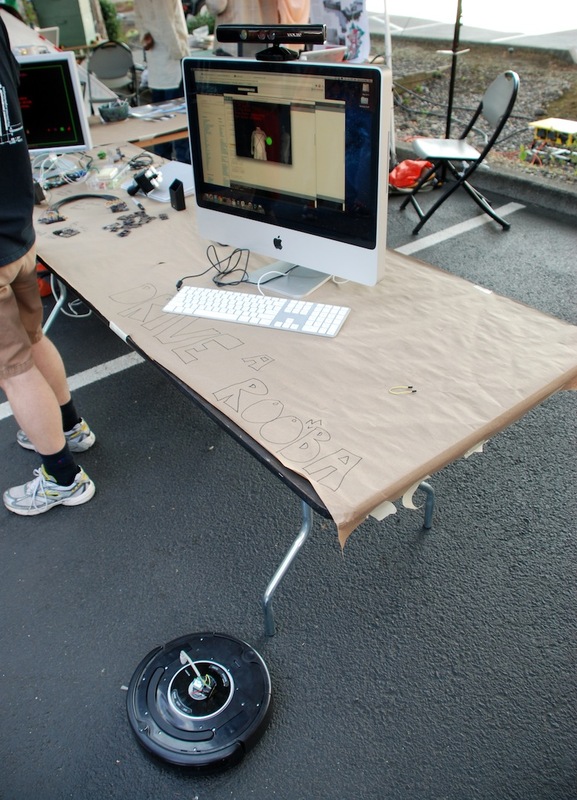 I thought I had it all covered – but after I got all my gear out at the faire, I found I was missing the power cable for my iMac. One of my fellow Dorkbotters, Scott, had a spare. Disaster 1 averted! Once I got setup, I tried to run a quick demo and ran into my first problem: The Kinect performs very poorly in daylight. I woke up about 5:30 that morning with the thought “Oh no! Will it work outside?” The answer it turns out, is “maybe”. The Kinect relies on Infrared Light being reflected back at it’s sensor to read depth. Aside from an occasional bout of cloud cover, most of the morning rendered the Kinect driving a no-go. I had a backup available as I’d written a program earlier to test driving the Roomba via Mouse Movement. ← My Mac is not giving up yet. I enjoyed your project and was impressed that you had something to present in such a short period of time. Good job! I think one of the keys to feeling successful as a Maker is that you have to abandon comparing yourself to others in the community. Especially in this community, you’re always going to find someone smarter, or more experienced who has done something similar to what you’re doing. It can be a little daunting. Once you learn that your accomplishments are worthwhile, regardless of those who’ve gone before you, you can much better appreciate what you’re doing, and what you’ve done.